I enjoyed Magic by the Lake much more than I did the previous book in this series. It was great to read about the adventures of Martha, Katherine, Jane, and Mark again! 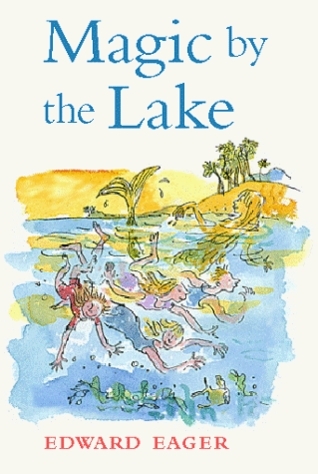 In this book the children spend the last part of their summer (only a few weeks after Half Magic ends) at a lake with their mother and stepfather, Mr. Smith. They go on many exciting adventures including the South Pole, the Arabian desert, and a mysterious island; Jane and Katherine also experience what it is like to be sixteen. It was a fun, entertaining, and exciting read that was suspenseful, but never frightening, which is perfect for young children. I continue to enjoy all the literary references throughout these Tales of Magic books, and there were plenty in this one! I loved how their silly adventures actually served a purpose as they did in Half Magic. In this story they end up finding a way to save Mr. Smith’s bookstore, and learn many valuable lessons along the way. The one part of the book that I don’t believe is suitable for younger children is the part when the children are on the island and they encounter natives who are depicted as violent cannibals who speak a funny pseudo language. The natives actually tie them up and put them in pots! They almost get cooked but are saved by some other children who happened to show up on the island at the most perfect time. The are characters who are becoming much more developed and have distinct personalities! I love how their personalities and relationships to each other seem so real (though I am sure there would be more arguing and fighting among four siblings). This is a great book for any child or parent who has enjoyed the other books in this series. If you love fantasy and magic you will probably enjoy this book.